Of the many tasks hikers must think about before a long distance hike, food is at the top of the list. Where will you resupply? How much food will you need? What will you eat? How do you choose which food to carry? Either because they see no other option or because they don’t see the benefits of choosing healthier foods, many hikers settle on the standard diet of highly-processed packaged foods by default. 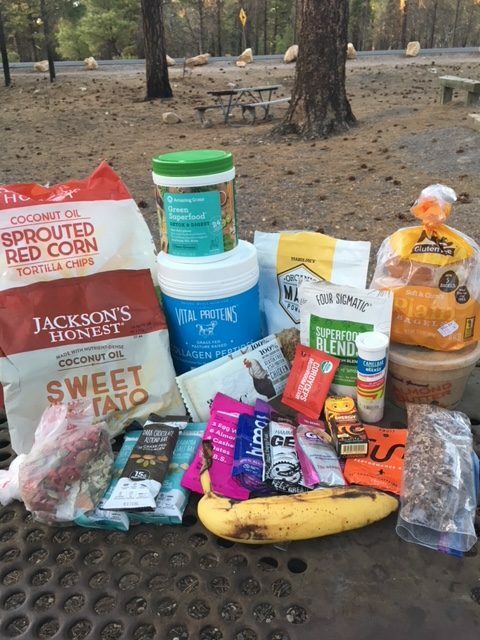 In this video, I give you a glimpse into what a sample day of eating might look like on trail for hikers who prefer simple to prepare, whole food options for increased energy, faster recovery, and better endurance. Like this? Sign up for my bi-weekly newsletter and be the first to know when new posts come out! A version of this post originally appeared on the Trek website here. I love this hike (or run–depending on how fit I am). 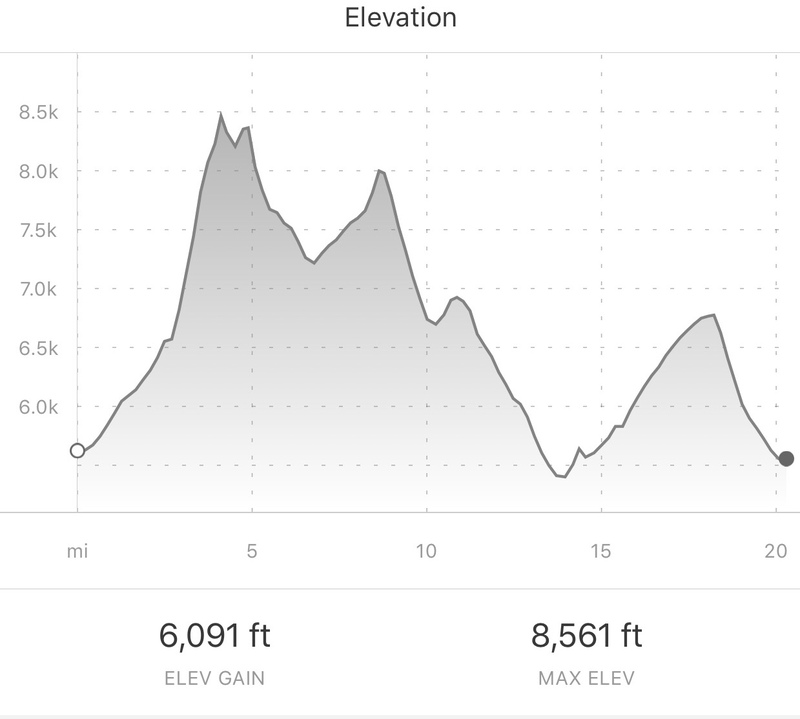 It’s a convenient and easy option when I want a longer day on trails, with respectable elevation gain, but I don’t have the time to get deeper into the mountains. Planning is easy and I also don’t have to fight traffic. I’ve done this hike a few times. The photos here are from a hike in early April 2018 while we were still getting occasional spring snow in the front range. The morning was chilly and there were light snow flurries in Boulder. 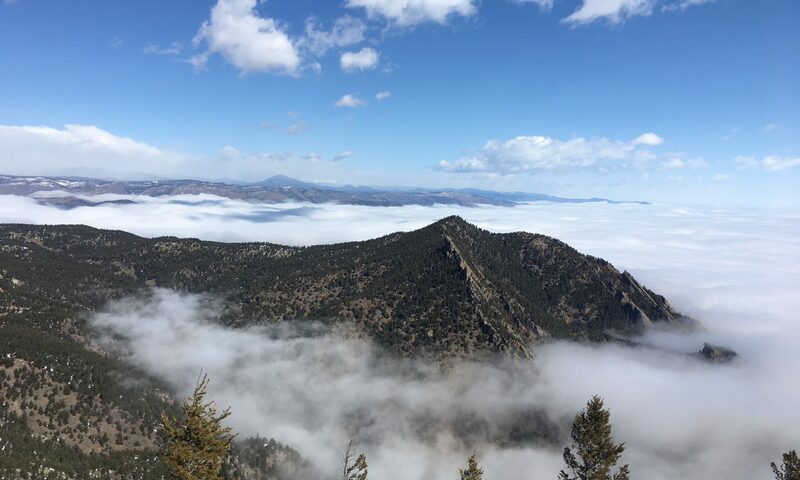 I hiked through fog up Shadow Canyon and arrived to sun and the most beautiful inversion (see photos below) at the saddle between South Boulder Peak and Bear Peak. The sea of clouds remained for most of the day. The intention for this particular Skyline Traverse, beyond just an enjoyable day in the foothills, was to test my fitness level for a bigger hike I had in mind. Length: Ranges from 16-26 miles, depending on which trails you choose and whether you hike point to point or create a loop. Location: Located in the iconic Rocky Mountain Flatirons, this hike hits the five highest peaks in the foothills surrounding Boulder, CO. The peaks include South Boulder Peak, Bear Peak, Green Mountain, Flagstaff Mountain, and Mount Sanitas. Trail Type: Due to its proximity to an urban setting, this hike can start and finish in several different locations, depending on your logistics and the level of challenge you’re seeking. Scenery: A mosaic of ecosystems from grassland to mixed ponderosa pine-douglas fir forests to rocky outcroppings and mountain streams. The traverse also showcases views to the east overlooking Boulder, Denver, and the plains beyond. Terrain: Moderate to Difficult. There’s a system of well-maintained, connected trails throughout the area. With a total elevation gain of about 6000’, this hike makes for a solid day. 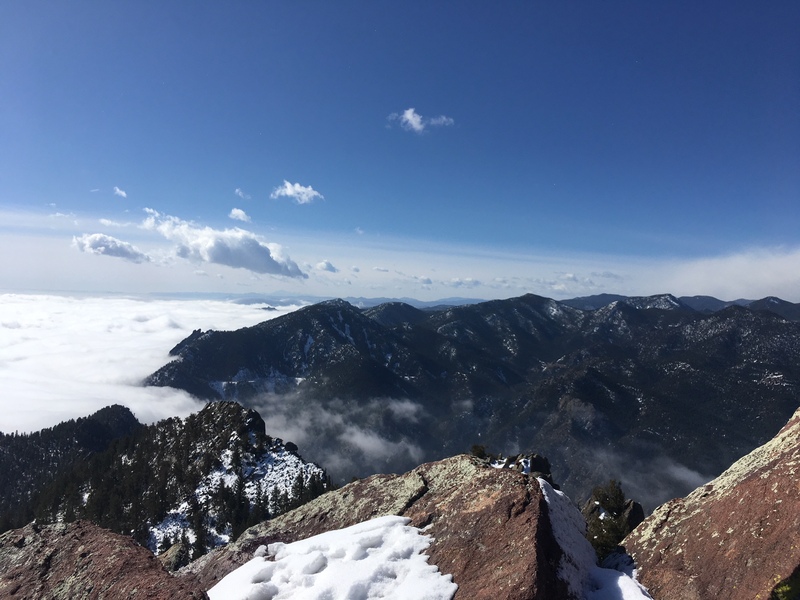 However, if you’re heading south to north, once you climb the initial 3000’ to your first peak (South Boulder Peak), you’re mainly hiking rolling terrain along the ridgeline until you drop back down to Boulder before ascending your final peak of the day (Mount Sanitas). Navigation: Straightforward. Check out a trail map of the area in advance and know your turn-offs. The trails are not particularly well-marked, but if you’ve looked at a trail map in advance, you should have no problem. 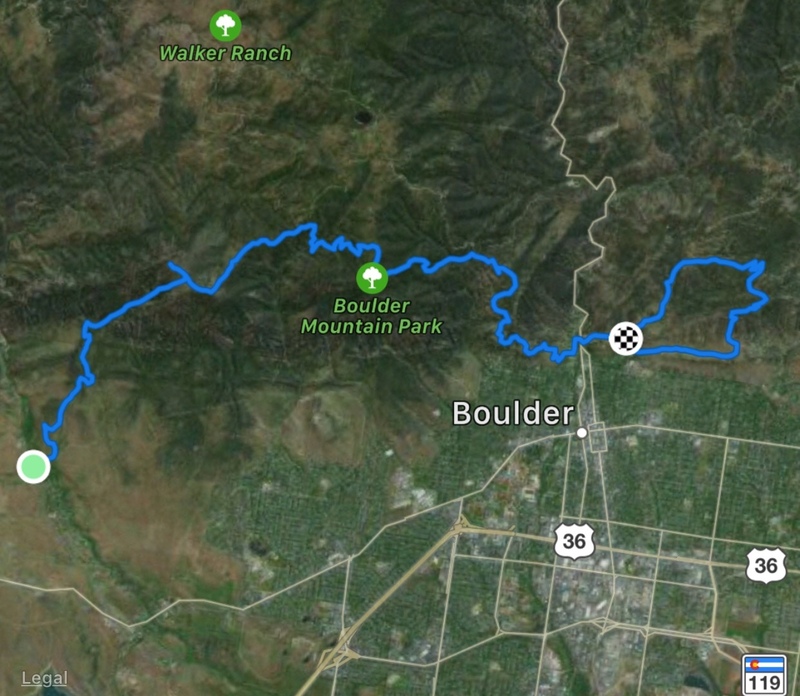 The city of Boulder provides a good interactive map of the trails on Open Space and Mountain Parks land here. You could print out a map of the area and highlight your route or plot it on a mapping app. 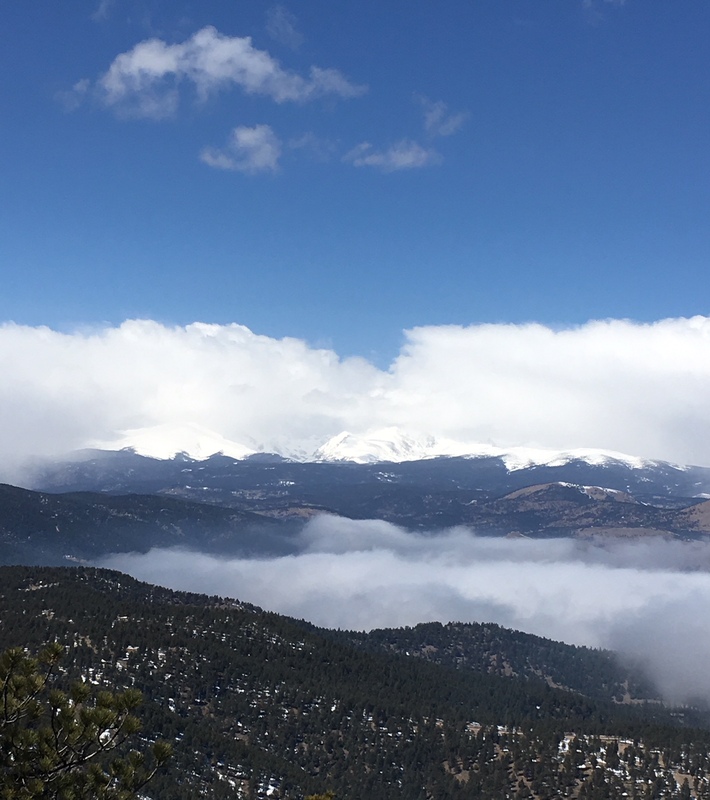 Getting There: Depending on which direction you hike and whether you want to make it a loop, there are many options for where to park, including South Mesa Trailhead, NCAR, Shanahan Trailhead, Chautauqua Park, or Mount Sanitas Trailhead. For a point to point hike, park at either South Mesa or Mount Sanitas and get a shuttle to the other end (or bring a buddy with a second car). If you have non-Boulder County license plates, there’s a $5 fee to park at South Mesa. For my south to north hike, I parked at Mount Sanitas Trailhead and rode with a friend to South Mesa trailhead. I chose south to north to get the biggest climb of the day behind me early. It’s about a 3,000’ climb up Shadow Canyon to South Boulder Peak. From there I crossed the saddle over to Bear Peak, and descended via the Bear Peak West Ridge Trail. At the fork, I turned left on Green Bear Trail and hiked about 1.5 miles to the Green Mountain West Ridge Trail. I took that to Green’s Summit then backtracked to Ranger Trail, which descends about a mile until it forks left towards Flagstaff Road. Once over the underwhelming Flagstaff summit, I found Flagstaff Trail, which I followed down to View Point Trail, then down into Eben G. Fine park. 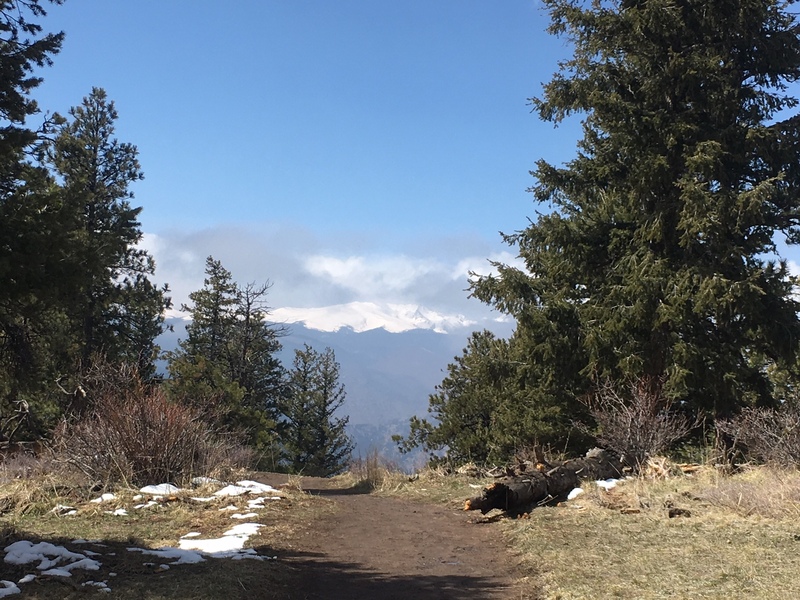 After crossing Boulder Creek, I made my way towards Sanitas via Sunshine Canyon, hit the summit, and returned to my car via the East Ridge Trail. 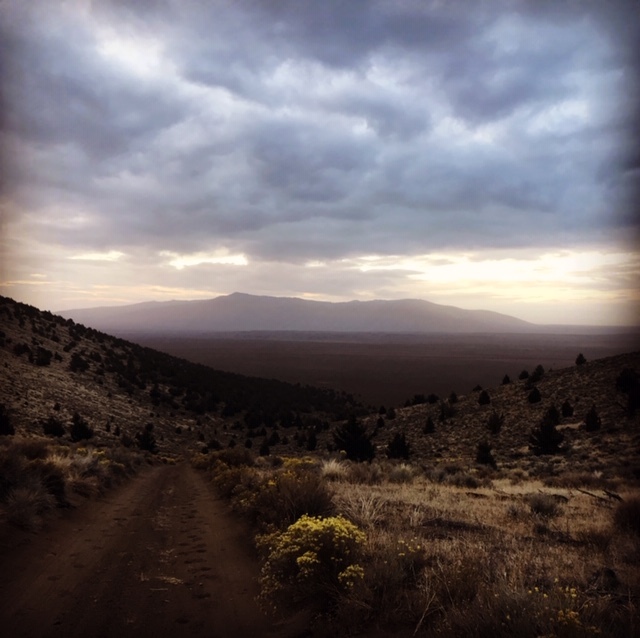 Why Hike This Trail: If you live in the area, this is a classic run or hike. The Boulder County Open Space and Mountain Parks are arguably some of the best in the country. 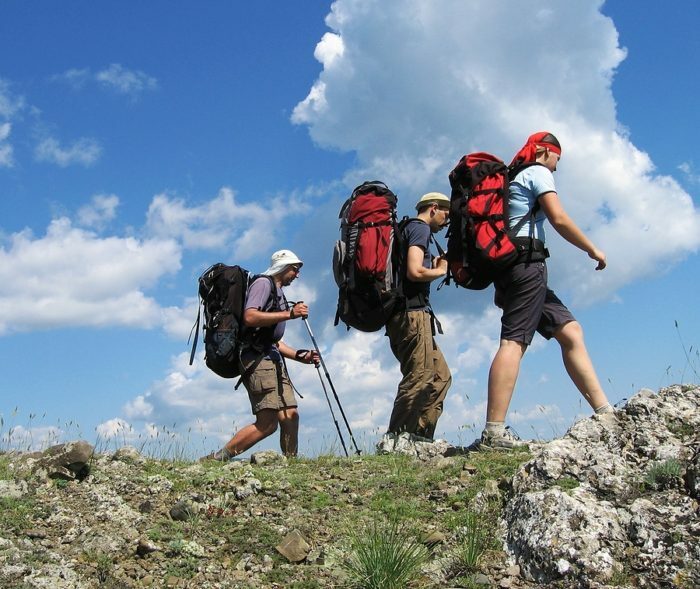 Planning this hike is simple enough to be done in an afternoon and the logistics are easy. The terrain is challenging enough to keep you engaged, but not overwhelmingly difficult. 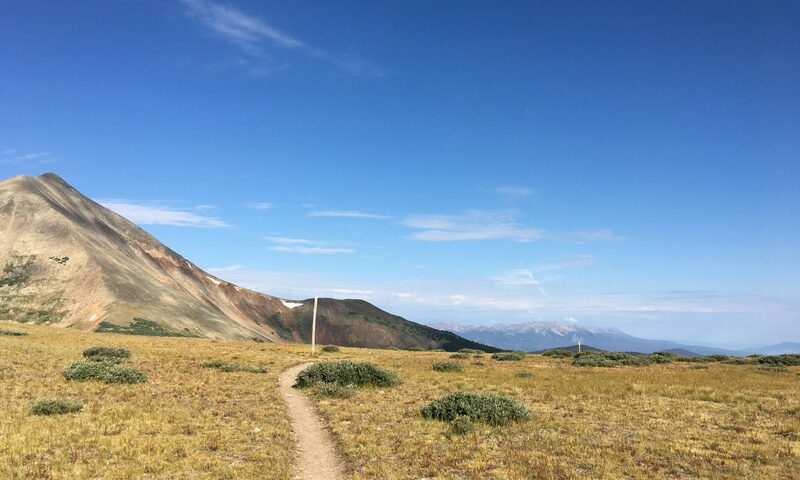 This trail allows you to put in a good day of miles and elevation gain, travel through the beautiful foothills ecosystems, and be rewarded with views of the city. Plus, you get to relax and refuel afterwards in Boulder, with it’s many good restaurants and breweries. Climate and Weather: This hike can be done year-round. Microspikes are recommended in the winter, as snow and ice often remain on the peaks, even when the ground is clear in town. Late spring and summer are beautiful times for wildflowers, and fall is a great time to spot golden aspens along the trail. Beware of afternoon showers in the summer. Due to the change in elevation, weather and temperatures can be quite different from your car to the peaks, so bring layers, and always have at least a wind/rain jacket. Don’t let your proximity to town cause you to be careless. 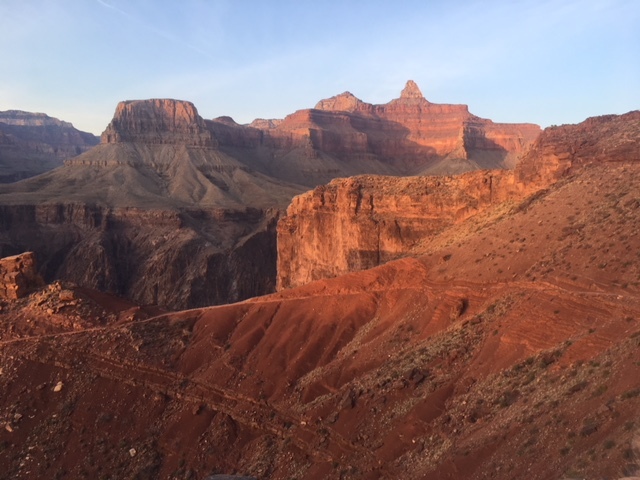 It’s still a mountain environment with common dangers like sudden thunderstorms and snowstorms, slippery rocks, sun exposure, and areas with steep terrain. 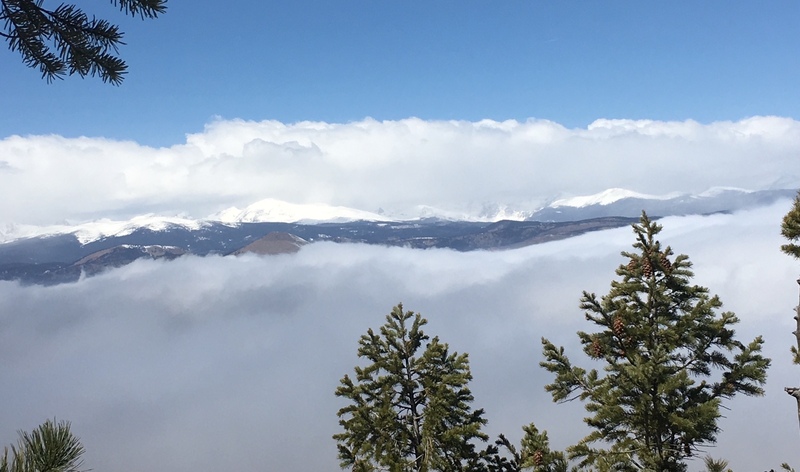 Camping & Water Sources: While there is no overnight camping along this traverse, there’s a lot of national forest near Boulder where you can camp before or after. A Google search will provide several options. 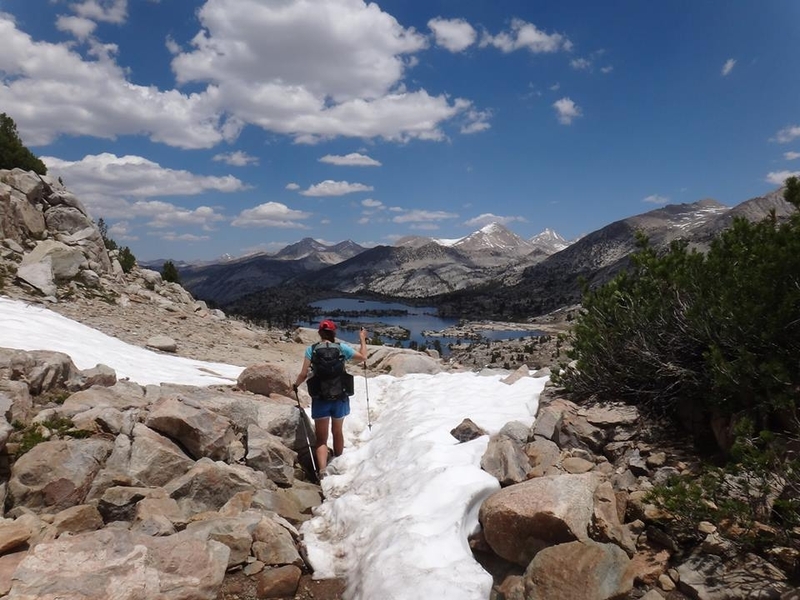 In terms of water sources, there are a few creeks along the traverse where you could collect water if needed, but since it’s a day hike, it’s also easy to just bring the couple of liters you’ll need. 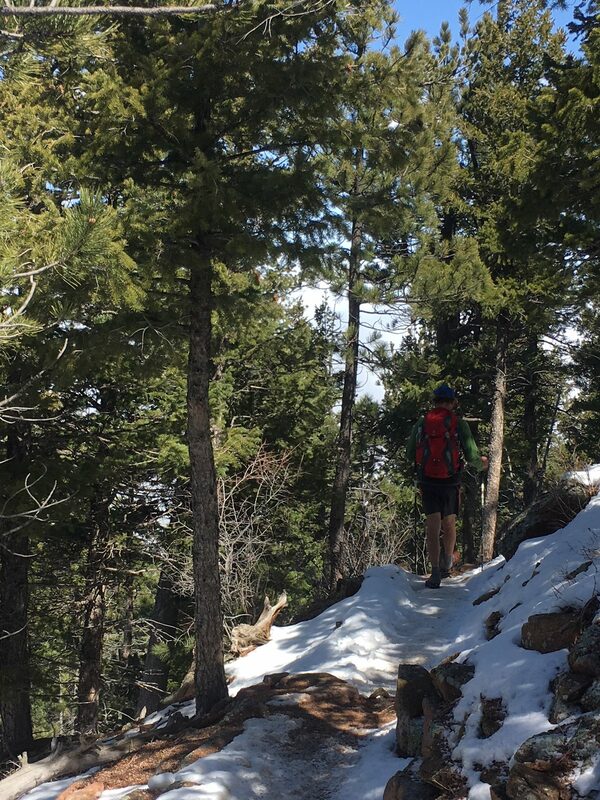 Closing Thoughts: The length and elevation gain of the Boulder Skyline Traverse are ideal for a challenging day hike. Logistics are a breeze due to the accessibility of the trailheads and the proximity to town. 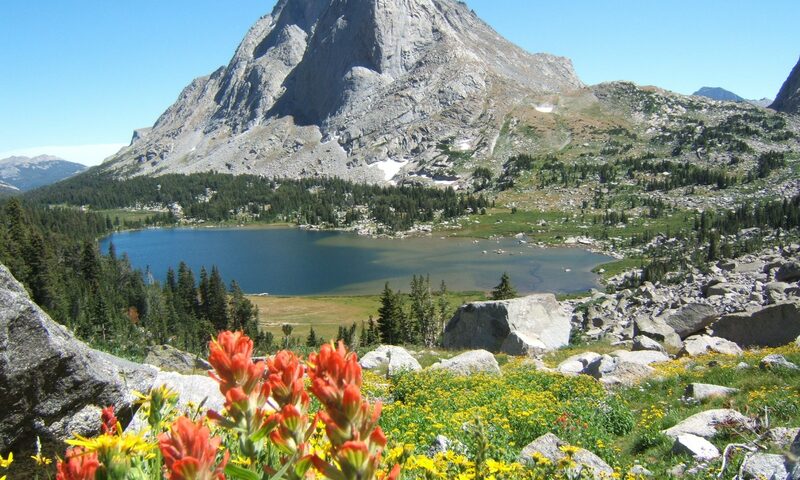 The diverse ecosystems, the stunning views of Boulder, and the availability of post hike libations make this hike a great activity for well-trained visitors and locals, alike. Much has been written about the Skyline Traverse, so you’ll have no trouble finding more information. If you’re in the area, do a bit of planning, then get out there and hike (or run) this classic Boulder traverse. You won’t regret it! 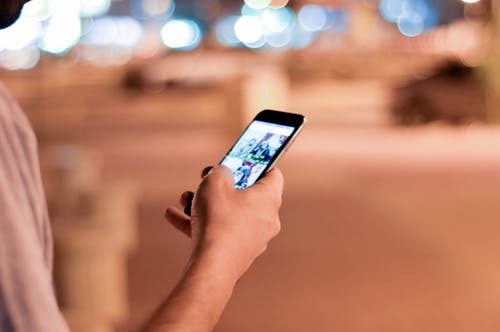 To stay in the loop with the latest posts, and musings that don’t make it onto the blog, sign up for my newsletter here. The days are growing longer and if you haven’t already started getting back outside and getting after it again, it’s time. 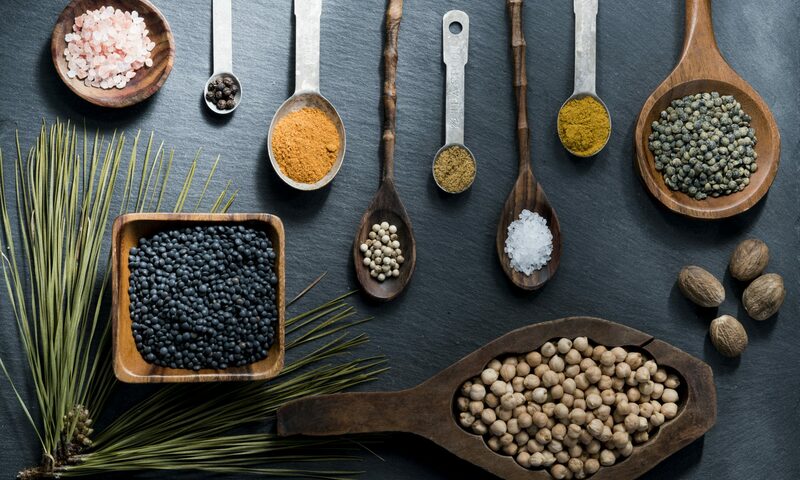 It’s easy to understand how what you eat and drink can impact your body’s performance, but did you know that you can optimize your active lifestyle with certain herbs as well? Herbs can aid in reducing inflammation, improving stamina, and increasing speed of recovery, among other benefits. Include the following herbs in your daily routine to help your body perform better, whether your preferred style of movement is running, biking, backpacking, yoga, or a stroll in the park. Adaptogens are a class of herbs which promote homeostasis and increase a person’s resistance to stress. 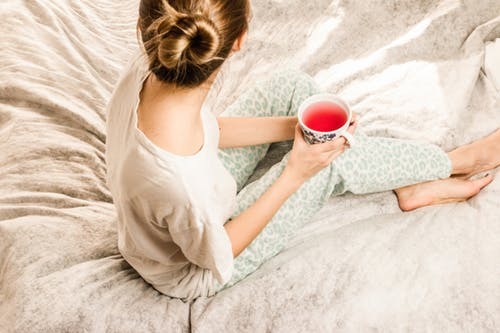 Some key adaptogens to consider for an active lifestyle include Rhodiola, Eleuthero, and Ashwagandha. In regards to athletic performance, Rhodiola has been shown to reduce both lactate levels and parameters of skeletal muscle damage after an exhaustive exercise session. Eleuthero, also called Siberian Ginseng, has long been used by athletes to improve endurance. This study showed that 8 weeks of supplementation (800 mg daily) “enhances endurance capacity, elevates cardiovascular functions and alters the metabolism for sparing glycogen”. Ashwagandha is another herb that has been shown to improve aerobic capacity. Eight weeks of supplementation (500 mg twice daily) significantly improved VO2 max and time to exhaustion. Turmeric is well-known for its anti-inflammatory effects. 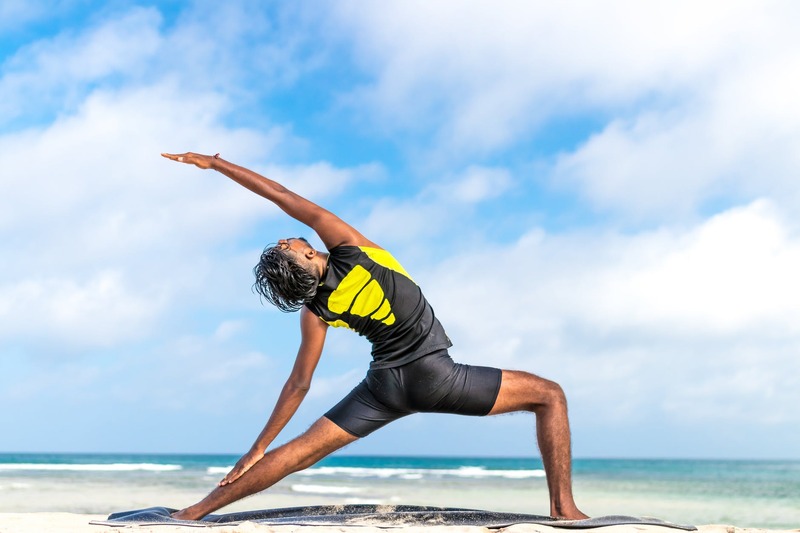 Studies indicate that the anti-inflammatory properties of curcumin, the active component in turmeric, may offset some of the performance deficits associated with eccentric exercise-induced muscle damage. This 2014 study indicated that athletes supplementing with Cordyceps and Reishi mushrooms showed an increased capacity to quench free radicals, thereby protecting them from oxidative stress and over-training symptoms. In addition to its hormone-balancing effects, research suggests that Maca root, taken daily for as little as 14 days, has the ability to improve endurance in athletes. In addition to considering these herbs to facilitate an active lifestyle, support a healthy, balanced body by including a mix of strength training, aerobic training, and stretching into your physical routine. With a little planning, supplementing with high-quality herbs can enhance and optimize your active, healthy lifestyle! This post originally appeared on The Trek, which you can find here. Hikers burn thousands of calories a day, so the quality of the food doesn’t matter, right? 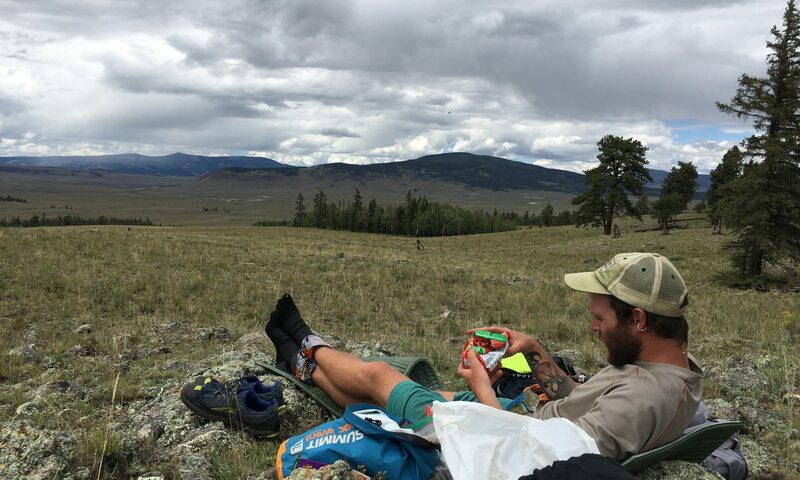 When it comes to food on a long trail, the focus is usually on calories and palatability. Little attention is paid to the long-term impact of our food choices on our health and the environment. I’ll outline 10 reasons to make real food your primary fuel for endurance endeavors, as well as simple steps for how to make the transition. Before we can avoid them, we must know how to identify them. Foods where real ingredients have been stripped out and replaced with substitutions. Foods that are created in a lab rather than grown in soil. Foods that have an ingredient label containing substances you can’t pronounce. 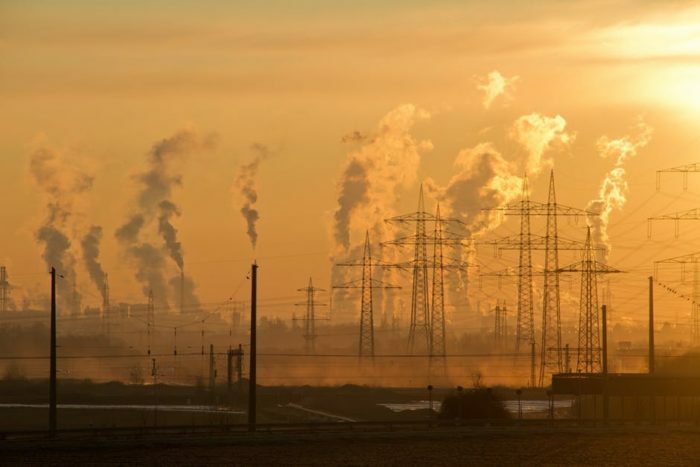 Foods that are produced in a way that’s destructive to the environment. ‘Faux foods’ may not be the most accurate descriptor, as the foods are not necessarily fake, but it’s a good catchall for these foods, and it’s catchier than ‘non-food junk’, so that’s what I’ve settled on. 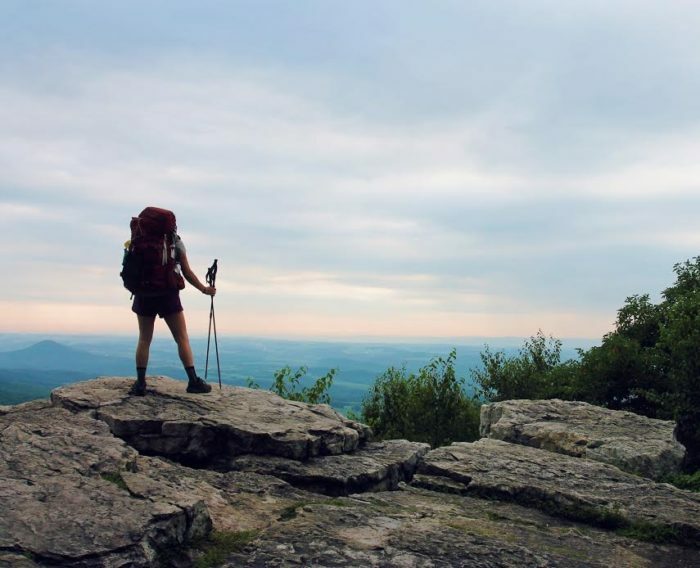 But there is one diet that is arguably even worse, and that’s the standard Thru-Hiker diet. This diet consists primarily of heavily processed, packaged foods, which are loaded with preservatives, artificial ingredients, colorings, trans fats, and excess sugar. 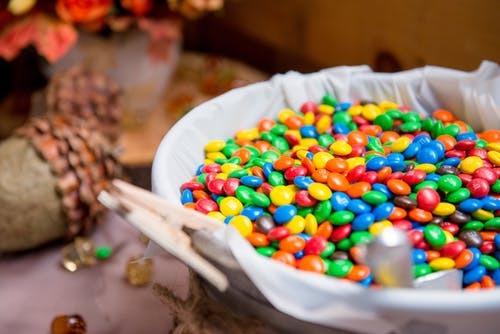 Of course, this way of eating developed because hikers need high calorie food, which is light, packable, and tasty, but many are unaware of the dangers of faux foods and the alternatives which exist. While many hikers can get by on Snickers and Doritos for a few months with seemingly few consequences, junk food has real implications on your energy, your performance, and even the outcome of your hike. You’ve no doubt heard this before, but just let that sink in. What you eat literally becomes the components of your body. Do you want to be made up of artificial ingredients that were synthesized in a lab or would you prefer your cells to be made up of real, living things which grew from soil, sunlight, water, and air? The full body inflammation caused by excess intake of faux foods makes us more susceptible to injury and illness. In 2017, injury and illness accounted for 17% of AT hikers quitting their thru-hike attempt. The main drivers of inflammation in a typical hiker diet arerefined sugar and trans fats. Intricately tied to inflammation is the health of the gut lining. 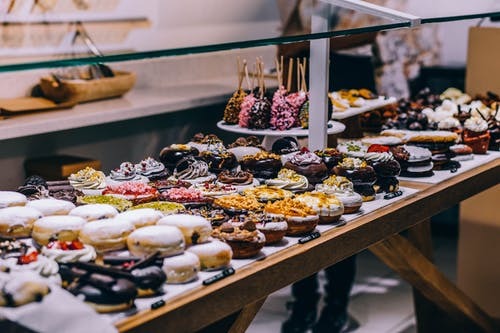 Sugar and refined ingredients, as well as several food additives and preservatives, have been shown to disrupt the digestive system – especially when exposure is chronic. This also impairs absorption of the limited nutrients that are being taken in. 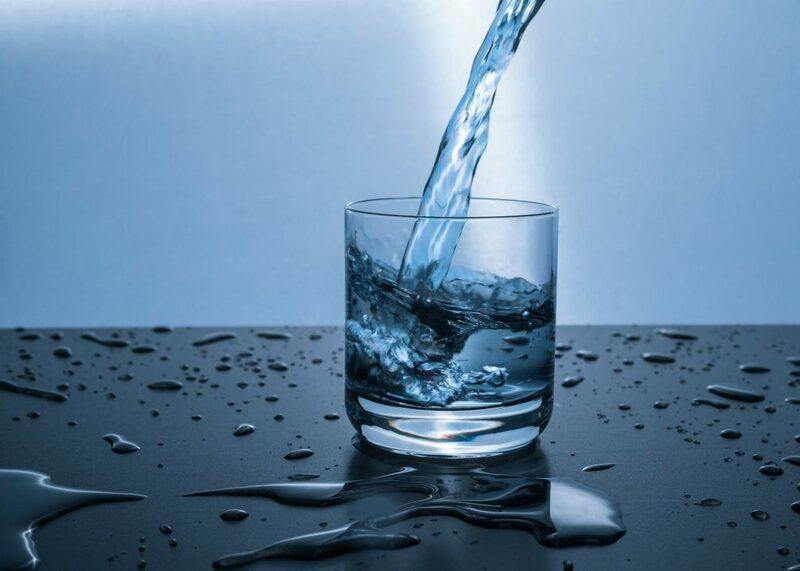 If your body is lacking in essential micronutrients, it takes longer to get back to full speed. Thru-hikers beat their bodies up daily, so fast recovery is key to feeling great day after day. Faux foods are more likely to result in these long-term health conditions that will affect you long after you’re off the trail. Processed foods are also more likely to cause allergies. Chronic inflammation suppresses your immune system, thereby causing slower wound healing. It’s not uncommon to endure small wounds on trail, and quick healing reduces the chances of developing a serious infection that could end a hike. Completing a long hike often requires long days. 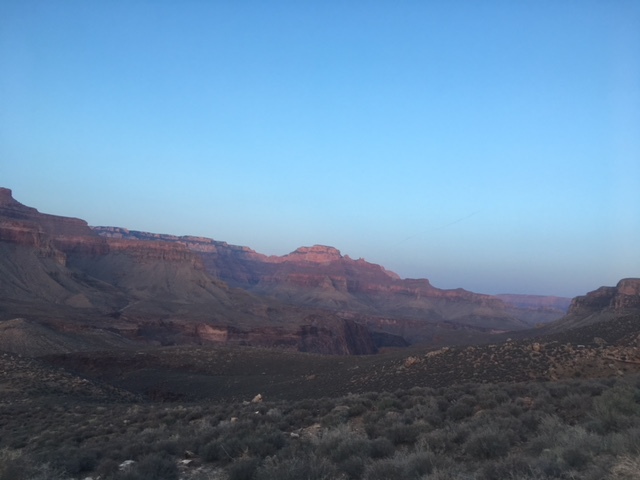 The key to having sustained energy and hiking big miles is maintaining balanced blood sugar by steering clear of highly-refined, processed foods. It’s often said that thru-hiking success is 90% mental. Whether you agree with that or not, there’s no doubt that the mental game is a huge part of successfully completing your adventure. Steady blood sugar helps you make better decisions and stay motivated over the long haul. Most hikers are ambitious people with big plans. Rather than ending your hike exhausted and burnt out, it’s possible to recover faster and be ready for your next adventure without having to spend months on the couch in front of the TV. 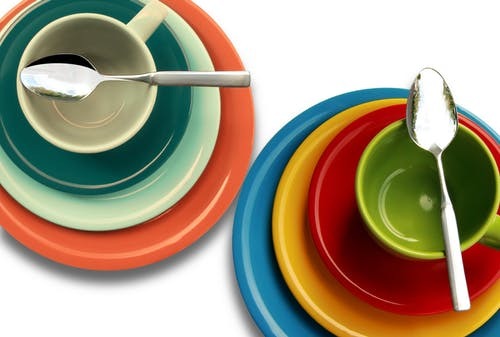 Faux foods lack the nutrients and antioxidants that will help you bounce back faster. Faux foods often have plenty of calories, but are deficient in nutrients, leaving the body unsatisfied. This leads to endless hunger and results in carrying more food than you may actually need. The environmental impact of our choices is something we all need to be aware of. Industrial, highly-processed, GMO-filled foods increase the profits of mega-corporations at the expense of the environment we love so much. Think of your food choices as a continuum with a 100% Faux Food diet on one end and a 100% seasonal, organic, unprocessed, local (SOUL) diet on the other end. This framework helps me work towards making better choices when I can, but not getting so caught up in rules and ‘shoulds’ that I give up entirely. Nuts, seeds, dried fruit, and dehydrated veggies are all great choices. There are lots of ideas online and you can also check out my free Eat for Endurance ebook for more ideas. 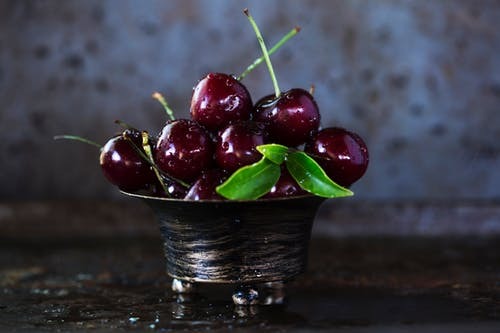 This will help avoid excessive added sugar, trans fat, and additives like artificial sweeteners, high fructose corn syrup, sodium nitrate, sodium sulfate, food dyes, potassium bromate, and MSG. Don’t be stuck eating gas station food for a week because you didn’t plan ahead. You’ll feel gross and you’ll compromise your energy and performance. Choose fresh vegetables and salads instead of (or at least in addition to) pizza, burgers, and beer. Ingredients in Organic Tortilla Chips: organic corn, organic sunflower oil, salt. Start slow and do what you can. Even making a few small changes is a good step towards fueling yourself for performance and creating a better environment at the same time.